From lobbies to elevators, our reinforced stone panels are the perfect solution for an extensive range of interior spaces in your building. All of our products have the natural elegance of stone without the downside of being fragile and brittle. Unlike dimensional stone, the material that we use is flexible, lightweight, easy to handle, and does not require professional lifters or heavy equipment. Just how simple is installing our TerraCORE Panels? Extremely simple! The material can be cut by anyone using simple carpentry tools and field-cut using a portable saw with a diamond tip blade. Without the need for specialized labor, installation becomes a much simpler task and your building can remain occupied during the process with minimal disturbance to any occupants. You can even perform renovations during after-hours without disturbing residents or guests. 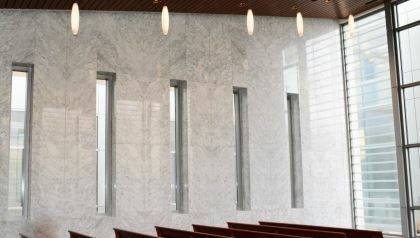 For most interior stone paneling renovation projects, we recommend over-cladding as the most cost-effective and efficient option. This process involves covering existing areas with our panels rather than removing the original material, saving you both time and the high expense of removal and disposal. At the end of the project, your building will not only have an improved property image, but a higher property value as well. In fact, we provide commercial owners with an immediate return on investment (ROI) through increased building occupancy, higher rates for rent, and greater overall satisfaction from their tenants. Find out how our interior paneling can help maximize your investments by contacting us at (214) 749-0999 today!